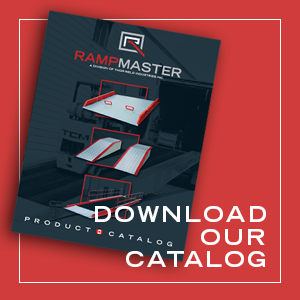 Rampmaster’s line of lightweight aluminum wheelchair and scooter ramps are hinge-folded for ease of transportation. Take them with you to visit friends, go shopping or go on vacation. 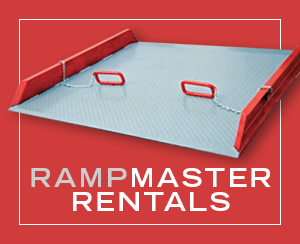 Most ramps are rated for 350 lbs. per pair, good for normal applications including the weight of manual wheelchairs. For custom applications please call. 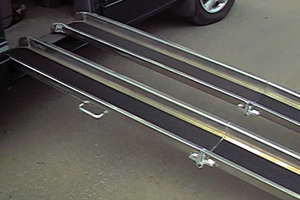 Our Standard aluminum folding ramp – 6ft., 8 ft. and 10ft long extended. 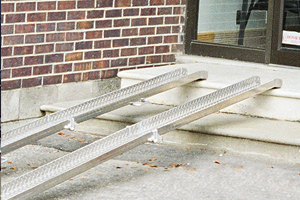 Special wheelchair ramp folds lengthways. Good for scooters. 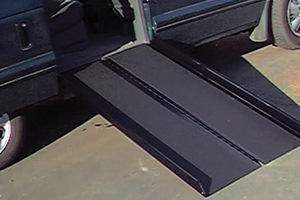 10ft folding wheelchair ramp made from smooth aluminum with special 3M surface for grip. AFR-6 6′ 3′ 2-3 18 24 lbs. 350 lbs. AFR-8 8′ 4′ 3-4 27 29 lbs. 350 lbs. AFR-10 10′ 5′ 4-5 36 48 lbs. 350 lbs. AFR-6W 6′ 3′ 2-3 18 27 lbs. 350 lbs. AFR-8W 8′ 4′ 3-4 27 33 lbs. 350 lbs. AFR-10W 10′ 5′ 4-5 36 56 lbs. 350 lbs. AFR-6W-HD 6′ 3′ 2-3 18 32 lbs. 450 lbs. AFR-8W-HD 8′ 4′ 3-4 27 44 lbs. 450 lbs. AFR-6W-EXHD 6′ 3′ 2-3 18 43 lbs. 575 lbs. AFR-8W-EXHD 8′ 4′ 3-4 27 56 lbs. 575 lbs.